Christephi.com: Activity Day: SPA DAY! If you have a little girl, it's likely you've read a Fancy Nancy book or two. Miss M received a copy of Fancy Nancy: Ooh La La! It's Beauty Day (affiliate link) from her auntie and absolutely loves it! She's been pouring over it for weeks and begging to have a Spa Day. We decided that in honor of our last week day off before starting second grade, we'd have a special Spa Day! Mash half a ripe banana in a small bowl. Add in about half a teaspoon of honey. Mash the mixture some and put it in the fridge until you're ready to use it. Miss M had begged for this. She even got out the ingredients for me. But one look at that slimy, banana scented goop and she had an instant change of heart! She let me apply it to her in spite of her wails of protest and cackling laughter. 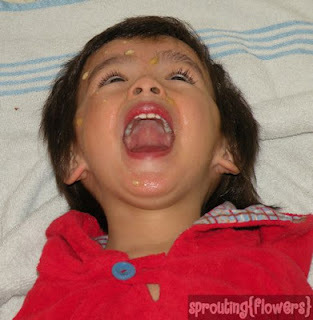 Little Guy's response was: "I'm ugly! I'm ugly!" until I wiped it all off of him. The next order of business was to manicure their rather grubby little mitts. This involved the usual nail cleaning, trimming, and filing. 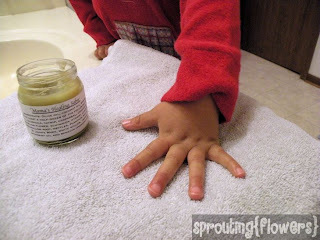 We used Mama's Healing Salve for cuticle cream. And Miss M picked out pink nail polish. While having her nails painted, Miss M said wistfully, "People always tell me I'm pretty, but no one ever tells me I'm fabulous." I guess she has high aspirations! 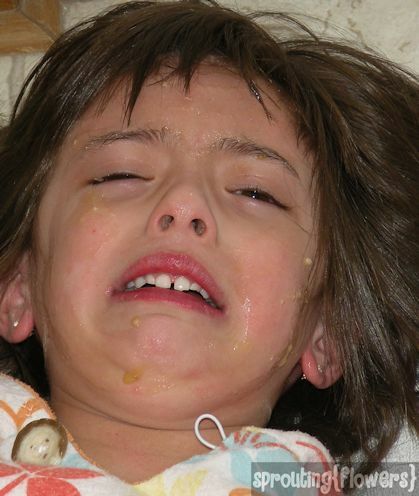 Have you ever had a footbath? It's heavenly! Miss M and Little Guy perched on the counters and put their feet in the sink. This made for a simple cleanup! I added a handful of Kosher salt and a few drops of eucalyptus essential oil (the "recipe" in the book calls for lemon juice, but this was already in the bathroom, so I went with it). While we waited for little tootsies to dry, I gave each of them a massage. They must see Hubby give me massages when my back hurts now and then because both of them groaned and sighed and said, "Yeah, yeah, that feels goooood!" It was hysterical! Our last spa activity were their pedicures. Little Guy had felt left out when he didn't get his fingernails painted, so I let him choose two colors for his toes: purple and yellow! 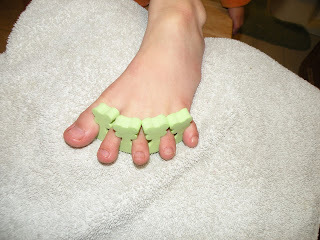 Miss M was so excited to finally get to use her foam toe separator. She asked me, "Mama, why aren't you more of a girly-girl?" I guess, sweet child, God didn't make me one. I have no desire to go get a manicure or pedicure. I would, however, like to get my hair done when spring comes. Are you a girly mama? Or do you shudder at the thought of a stranger touching your feet like I do?